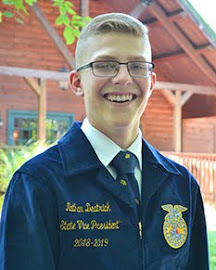 The Indiana FFA Leadership Center has transformed adventure by providing 164 ½ acres of land and 5 ½ acres of lake to be hiked on, swam in, sledded on, and made memories with. From each green, curvy trail to every drop of water in the lake to the low ropes course, this Center has created adventure for visitors, the State Officers, and FFA members. My personal favorites are when my teammates and I needed a break from office hours which lead to swims in the lake. We created our adventures by not only pushing each other in as we all laughed hysterically, but by jumping from the inflatable slide in any creative way we could think of, embracing the height of our rope swing, and taking the canoes out for a spin. The center has forever transformed adventure by sparking spontaneous moments that resulted in unforgettable memories. A push in the lake resulted in a team swim! Enjoying a fun softball game with a few of the 100,000 FFA members during Summer Challenge! Back to the question of “why?” Why have individual sponsors, companies, and families donated to Pay It Forward? 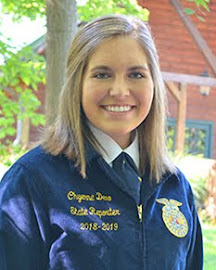 They decided to Pay It Forward because they understand the transformation the Indiana FFA Leadership Center has made. They understand the lasting legacy it leaves on everyone who enters these gates. Businesses like Farm Credit Mid-America and Indiana Farm Bureau asked “why?” Because they asked themselves these three letters, they decided to join our cause in maintaining the Center so 100,000 more FFA members can be inspired to transform their purpose into action. Thank you to Farm Credit Mid-America and Indiana Farm Bureau for matching up to $25,000 each, resulting in a total of $100,000. The transformation of adventure, definition of “home” and various others will continue to impact for years to come if YOU ask yourself “why” and donate towards our campaign. 7 new people each year have the privilege of calling the State Officer House home! 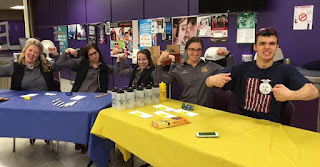 Check out this video of 101 Reasons to Donate to Pay It Forward, created by the State Officers! 93 days, 21 hours, 55 minutes and 10 seconds. 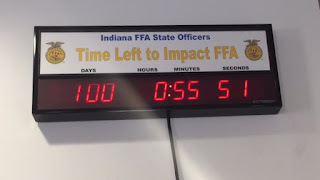 As I write this, I look up at the clock that reads, “Time to Impact Indiana FFA” with that exact time in our office. It is crazy to think that a few short months ago, the clock ticked 365 days and we thought that the day we would see double digits was forever away. Today, we look at the clock and see our double digits quickly diminishing along with our time to impact Indiana FFA. Many of you may be experiencing the same feeling of your life flying by so fast like a runaway train. Whether it is your remaining time in high school, college or another year passing by, it always seems like our time goes by so, so quickly. I can quickly recall my senior year in high school and where each day seemed to drag on until I had reached the end. Each #SeniorSunday post was one week closer. I couldn’t wait until the day until I walked across the stage of Whiteland Community High School and said ‘peace out’ to the stress of high school. Although, as the time became smaller and smaller every little moment seemed more and more important. I found myself enjoying the calculus lectures, walks to classes with my friends in the hallway and just hanging out in the Ag Room with all of my greatest pals more than ever before. The last few months of my high school career were full of laughter, memories and unforgettable experiences because I chose to make each and every day count. At my high school graduation party, it was great to celebrate achievements, but also the impact of making everyday count. As a team, we have often taken a pause in our office day to watch out clock tick down to the next day or hour, taking in the monumental changes on Snapchat. We wish we could make that clock stop and enjoy the exact moment we are in without seeing the seconds count down. Wouldn’t it be neat to stop the clock and not worry about our diminishing time? It may be a clock in our office or a countdown app on our phone, but we are always counting down until we have reached life’s next big milestone. As a team, we are making each of our days count! The cool thing is, is that each of us can take a moment, stop the clock and enjoy the moment we are in. We choose to make the most of each 86,400 seconds in the day – whether they are counting down to the next big event or not. We can choose to use this time to make an impact or we can waste every moment by watching the time disappear. There is a quote I’ve truly enjoyed as our time ticked away. “Don’t count the days, make the days count.” No matter what life experience you are counting down to, don’t count the time you have left – make each day count and leave the legacy you would want to leave. Grow leaders, build communities and strengthen agriculture. This set of words, the FFA Vision Statement, has been shared countless times this year. During chapter visits, students across the state learned what it means to grow as leaders, build their communities and strengthen agriculture. Growing leaders is self-explanatory, strengthening agriculture makes sense, but building communities has always been a point that is a little harder to explain. Sure, FFA members complete many community service projects, but the power of building our communities is deeper than that. The first thing that enters my mind when I think about what the word community means is simply where I live. My mind drifts to my next door neighbors and those who attend my school. As my mind continued pondering the word community, like most people my age, I pulled out my phone and googled it. Google defines a community as, “a group of people living in the same place,” but then proceeded to say, “or having a particular characteristic in common.” The second part explains a lot about the community that exists within FFA. 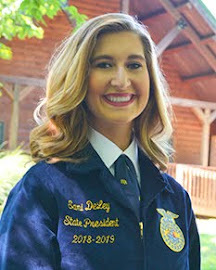 If you’ve been to National FFA Convention or even District FFA Leadership Contests, you know the feeling of pride when you’re surrounded by blue corduroy jackets. We look to the left and see a jacket from California, look to our right and see a jacket from Kansas, and look down and see our name perfectly stitched on a jacket next to an emblem that unites us into one community. A community 649,355 strong. A community reaching from the state of Alaska to the Virgin Islands and from the state of Maine to Hawaii. A community that accepts any person from any background and allows them to grow as a leader, build their local communities and strengthen agriculture in whatever career they may choose. A community that allows the shy freshman to become a confident senior and the confident senior to have a successful future. 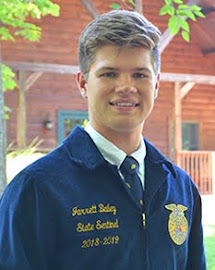 The second definition given of community was, “a feeling of fellowship with others, as a result of sharing common attitudes, interests and goals.” As I read this definition and related it to FFA, I got chills because that is exactly how I feel each time I zip up the blue corduroy jacket. That is why our organization is so powerful. 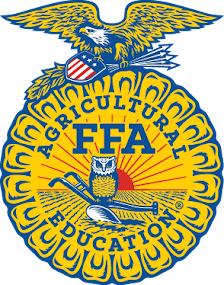 Times in FFA are times in fellowship with those who share interests, attitudes and goals. This was proven true this weekend as my teammates and I attended the Scottsburg FFA Annual Ag Day Breakfast. Saying it was hard for my teammates and I to be alive, awake, alert or enthusiastic for our 4:30 AM leave time was an understatement, but somehow 1,500 people braved the same early morning to attend the breakfast. That is the power of community. Believe it or not, for the majority of my childhood, I wanted to go to Indiana University in Bloomington for some sort of business degree. 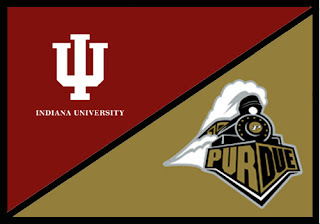 I was a huge Hoosiers fan from like fifth until tenth grade, anytime Indiana battled Purdue for the Old Oaken Bucket, I made my allegiance with the Hoosiers, every basketball game that was played between the two rivals, I backed the Hoosiers once again. However, towards the end of my junior year in high school when I began to actually begin thinking of where it was that I wanted to go to college, my eyes began to drift away from Indiana University, due to the size of the college, and they began to drift towards smaller liberal arts colleges. I was still stuck on majoring in a business degree, specifically economics when I was ready to begin applying to colleges my senior year. With that being said, I applied to seven different colleges for a major in economics, however, not a single one of those schools has more than 5,000 students, meaning, I didn’t apply to either Purdue or Indiana University. While I did get accepted into all seven of the smaller colleges, I still didn’t feel good about attending one of them, it just didn’t feel right, I just felt like I belonged at one of the Big Ten Universities. So, without giving it a second thought I applied to a much bigger college than I had previously planned on attending and I let the thought of attending a small liberal arts college exit my mind. So, the day before applications were do, I submitted mine and hoped that I would be attending college the next year at one of the spectacles of the Midwest, right here in Indiana. The only question is would I be wearing black and gold or cream and crimson. When it came down to it, I decided to turn to the black and gold and become a Purdue Boilermaker in West Lafayette. 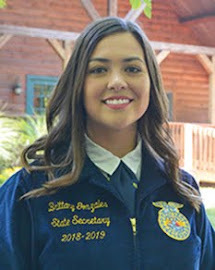 Throughout my senior year in high school, I had been taking two Ag classes that really helped me determine the course of action I wanted to pursue during my college years. So, I applied to Purdue University in order to major in Agronomy. 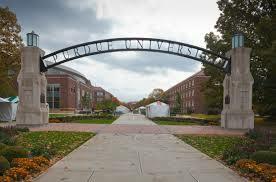 By deciding that I wanted to further my education at Purdue University, I decided to become a boiler fan. So, ever since being accepted into Purdue, I have continued to be an avid fan of the Purdue vs. Indiana games, only my support has been thrown to the other side. This men’s basketball season has been awesome for a Purdue fan and awful for Indiana fans, with Purdue beating IU in both of their match-ups, it’s a great time to be a boilermaker. With all of this being said, the love I have for Purdue University and the pride I have for being a boilermaker has done nothing but grow since I submitted that application. In conclusion, it can be said that Purdue is not just a great college of agriculture, but that it is a great university in general, so while I personally think Purdue is the best, I realize that others have their preferences. 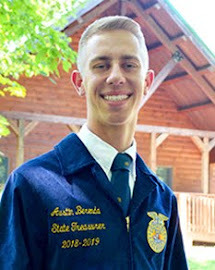 For everyone thinking about what college they want to go to or what they want to do after high school, consider what it is that you actually enjoy doing, I was able to establish that agriculture is the field I want to go into and that Purdue was the place that could get me into that desired field. Pursue whatever it may be that you want to and love what you’re pursuing and where you are going, oh and don’t forget, Boiler Up. I think it’s safe to say that our team can be a little random at times. Whether it’s making a spontaneous Kroger trip, voicing some of our most outlandish ideas, or making comical memes of each other, each of our random activities typically turns out to give us all a good laugh. Just a few weeks ago, however, one of those random little thoughts that I had, really got me thinking. After finally understanding the depth of this random question, I first approached my response statistically. 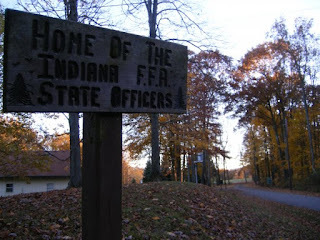 The Indiana FFA Leadership Center was established in 1968. Since then, we estimate that over 100,000 FFA members alone have traveled through its gates. Members from across the state and even the nation, sharing their culture, their passions, and their stories on the shores of this lake. In 1976 the first Indiana FFA State Officer Team moved into the FFA Center, with 40 teams and counting since then. That means 280 officers have rehearsed thousands of speeches and hundreds of workshops to this lake that is always willing to listen. 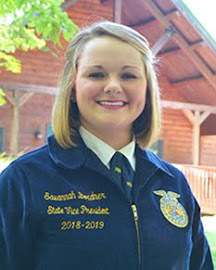 National FFA Officers have shared their retiring addresses with our lake before delivering it for the final time to thousands of FFA members from across the country, and I am sure that a first year FFA member has also shared the very first speech of their FFA career with the same lake. If our lake could talk, it would describe the love in the air as couples presented their wedding vows. Our lake would hold a moment of silence for the thousands of times FFA members rose Ole Glory proudly over her on a foggy spring morning. If our lake could talk, it would describe the laughter after a canoe full of boy scouts flipped, or when my teammate Emily belly flopped off the slide. Over the past eight months, my teammates and I have had the honor of living in a home that overlooks our beautiful lake. Whether it was watching fireworks on the dam, swimming in mid-September, or watching the steam rise up early each morning, the lake here at the Indiana FFA Center has set the foundation for many of our most cherished memories. As we embark on the final few months of our year, I am sure that it will continue to be the foundation for more. So, if our lake could listen, I would say thank you. Thank you for love and laughter that you have brought so many over the years. Thank you for setting the scene that has drawn so many into our gates. But most of all, thank you for standing with us through the joy of our first arrival, and what will soon be the tears of our final goodbye.